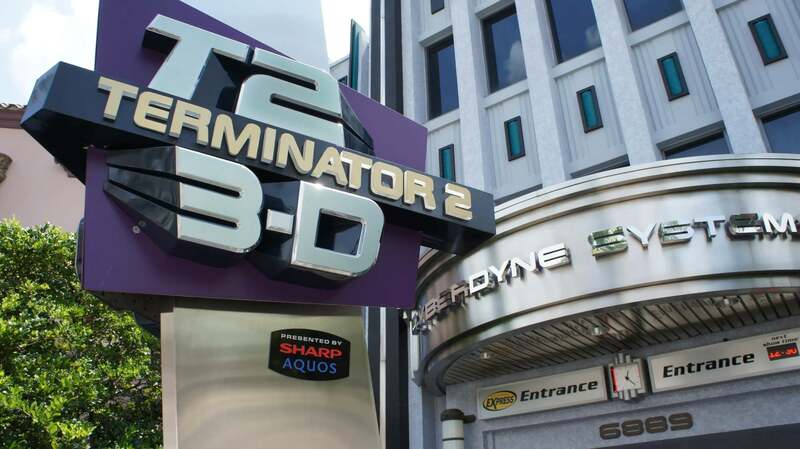 Get pulled into the struggle to end Skynet and save humanity as you take a special behind-the-scenes tour of Cyberdyne Systems. This is an indoor, sit-down show incorporating 3D film, live stage acting, and a few 4D in-the-theater special effects. 3 out of 5. Mostly loud sound effects from the battle. First show generally is not until 10:30 am. There should never be a wait time longer than the wait until the next performance (about every 20 minutes). Things go boom at the end. The film used in the show was directed by James Cameron and stars original actors Arnold Schwarzenegger, Linda Hamilton, Edward Furlong, and Robert Patrick. The show was upgraded in November 2015 with an updated preshow and equipment. Universal hasn’t said yet, although it did hint that it would be an “all-new live-action experience based on a high-energy Universal franchise,” which will open in 2019. Always one of my stops when I visit the parks. I absolutely love this attraction. I would be very sad, and maybe mad, if they removed this attraction. If anything, I'd love for them to update the show to 4K, like what someone else here suggested. Maybe add a bit more pyro effects as well - that's one of the main reasons why I love it (including the Terminator theme, since it's such a great story).I always visit this attraction when I visit the parks (season pass holder). The show has some of the best in theater effects you will find at any theme park. The updated preshow is amazing. The only thing that could use changing is updating the main show to 4K. This show is a hidden gem. It's tucked in a tiny corner in the studios side of the park. The mix of 3d, live actors, pyro and stunts are amazing. Really impressed with this show, and the pre-show is new and very good.